Jawbone’s successor to its popular Up24 has shrunk by almost half, is $30 less expensive and is expected to go on sale in Australia from June 10. Following it will be the Up3, the company’s first wearable with bio-impedance sensors, which are used for advanced heart rate monitoring and to provide detailed sleep insights. Jawbone’s head of international product management, Jorgen Nordin, said the company is striving to release the Up3 locally some time in ‘winter’, after problems with manufacturing led to the Up3’s release being delayed by more than six months. The company has since classified the Up3 as ‘splash resistant’ and not ‘water resistant to ten metres’. Launching within the fortnight is the Up2. It replaces the Up24 and represents an improvement in design and cost. Nordin claims it is 45 per cent smaller than the Up24. Whereas the band of the Up24 brimmed with battery and electronics, nothing fills the band of the Up 2. Nor does it have a 2.5mm connection for charging. Replacing it are small magnetic contacts found on its underside. The drop in size has not appeared to hamper battery life with Jawbone claiming it will last one week before being recharged. Our review model claims it can hold 8 days of charge. Distinguishing Jawbone’s wearables from its rivals is their ability to record detailed sleeping insights. The wearables work with a companion app to display sleeping patterns, daily walk count and to record exercise sessions. Jawbone’s Up2 will go on sale for $149, which is $30 less than its predecessor, while the Up3 will retail for $249 when it is released. 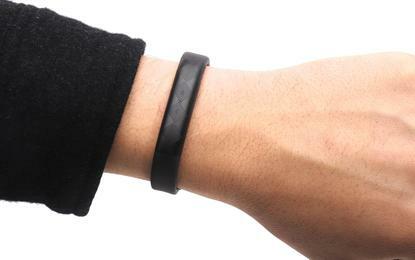 Stay tuned for the Good Gear Guide review of Jawbone’s Up2 and Up3.